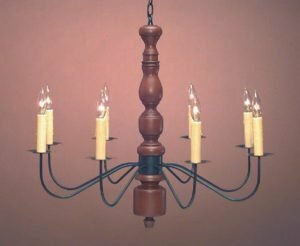 Hammerworks handcrafts each Country Wooden Chandelier CH112 one at a time to your exact requirements. Especially relevant, these compact four arm Colonial Wooden Chandeliers are perfect for a kitchen nook or small alcove. Or consider placing it in a powder room, bedroom or hallway. No matter what, the modest scale dimensions are perfect in any small space. Most importantly, whether you choose Elegant Colonial Chandeliers CH322, or this petite four arm model, our process remains the same. First of all, we turn each Country Wooden Chandelier using select hardwoods. Also, we bend each arm using your choice of antique tin or antique brass. 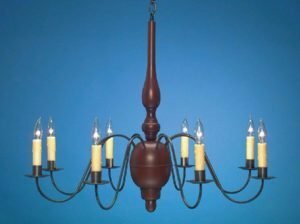 Furthermore, we supply your Early American Reproduction Wooden Chandelier with two feet of matching chain and a ceiling canopy. In addition, we provide several paint or stain finish choices. The result is a custom designed Country Wooden Chandelier. Consequently, through this process you can easily match your wooden chandelier to any color scheme. Most of all, with our 40 years experience creating authentic American lighting, you can be sure that we are the best choice when purchasing a Vintage Chandelier. We are also proud to offer an extensive collection of Colonial Wall Sconces. Most importantly, you can easily coordinate any of our Classic Design Tin Wall Sconces with Colonial Wooden Chandeliers. We handcraft each Colonial Reproduction Wall Sconce in the finish of your choice. Therefore, you can choose from antique tin, antique copper or antique brass as well as custom painted black finish options. Our sconces range from the simple and primitive Rustic Style Wall Sconce S131A to the formal look of Carpenter Hall Tin Mirrored Wall Sconce S133A. Therefore, no matter the size or style of your home, we have the right of Colonial Wall Sconces to complement your Rustic Wood Chandelier.